The “rock star” of handbag designers, Alison Burns, cranks out another slamin’ season of hits. With Allison Burns Basics, washed, distressed leather drapes soft, slouchy messengers, hobos and shoulder bags for a relaxed, LA vibe. For Allison Burns Deluxe, the designer collaborated with jeweler Michael Schmidt, who designed Madonna’s bra for her Hung Up video, to create gold plated studded pyramids. The two also created hanging charms – a skull and a razor blade – that dangle from leather, cow hair or lambskin handles. 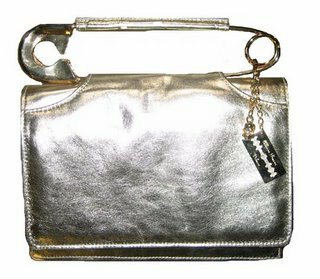 A not-to-be-missed clutch is the Starlet which had a 14kt gold safety pin as a handle.